Alex J. Cavanaugh: Cool Geek Christmas Gifts, How I Miss You Blogfest, and Ninja News! Cool Geek Christmas Gifts, How I Miss You Blogfest, and Ninja News! 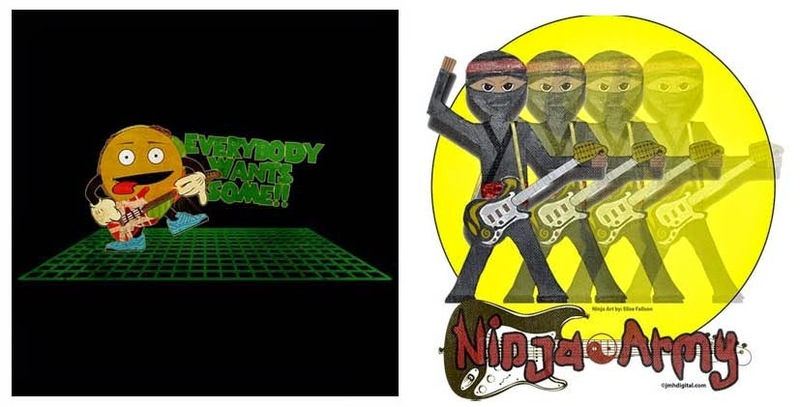 And of course, retro t-shirts from Jeremy Hawkins’ Neat-O-Shop, including the Better Off Dead hamburger and the Ninja Army! At the A to Z Blog today is Joss from Dreaming of Publication, talking about her theme for the Challenge – dogs! It’s time for the second annual Holiday Food Drive! Started by MJ Joachim and the late Tina Downey, MJ is continuing the tradition with Jeremy Hawkins again providing the graphic. Check out how you can participate HERE and at the Effectively Human Community on Google+. Are you a self-published indie author? Then you need to check out this giant list of indie book reviewers – over five hundred! Courtesy of laekanzeakemp. Want to know what it’s like to be a full time writer? Then you need to read this post by Steven Symes. Thank to everyone who has added Dragon of the Stars to their Goodread lists and voted for it in the Most Anticipated Science Fiction of 2015 list. It’s climbed to number three! Mark still posts now and then, but not at the same pace he used to post. The dude is a cool geek and I miss the geeky updates. Plus his A to Z Challenge themes always rock. One of my first blogger buddies was Old Kitty. She’d post photos of her cat Charlie, now joined by Gumtree. It’s been many months since she posted and I really miss her. No one is as upbeat and positive as Old Kitty. I couldn’t do this list without mentioning Tina. I think about her often and there is still this void where her snark and humor used to reside. There are people you can’t imagine being gone, can’t imagine dying, and that’s what I always thought about Tina. I know she’s having a grand time in Heaven, running through the sunflowers, but the world is just a little bit dimmer without her light. Love you and miss you, Tina. LG, you are a fellow science fiction geek and writer, and you are so faithful to your friends. 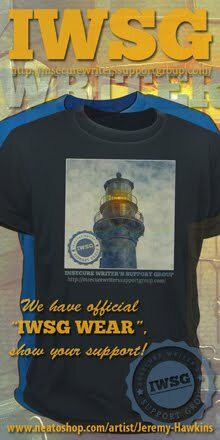 You always have the best A to Challenge themes and have dedicated yourself to the IWSG. (And you’re one of my best co-hosts.) You would be sorely missed, so don’t ever quit! Ivy, I count on you for my daily laugh and chuckle. We’ve followed each other for years and I enjoy both your posts and our email banter. You paused in your blogging once before, and it really sucked. Don’t do it again. You are indeed Wonder Woman. And you always make me laugh. Heather!!!! If I ever posted and there wasn’t an ‘Alex!! !’ in the comments from you, I’d send out a search party. You are one of the funniest, snarkiest, most spirited and strong-willed people I know. You rock the A to Z Team, keeping us in line. You’re such an awesome supporter and someone I can count on a hundred percent. You’re also one of my best friends. You ROCK! Who do you miss? Who would you miss? See some geeky gifts you just have to buy? Joining the Holiday Food Drive or picking up some new books? And who do you miss and who would you miss in the blogging world…? I will be traveling over the Thanksgiving holiday, so I’ll be very sparse here online Wednesday through Saturday. To all my American friends, have an awesome Thanksgiving! Will be doing my blogfest later, Good people you miss Alex. Wow, Alex. Had no idea you were gonna add me to this list. Thanks for that, you are one good egg. I've been blogging so much now, that I honestly forgot that I stepped away for a bit awhile back. Thanks for the reminder and the kind, kind words. Very very happy to know you and yeah, I enjoy the banter as well. These geek stuffs are great! I'd like to buy some. Hi Alex. The Dancing Groot has caught my attention - maybe it's the cutesy face! I miss HazelMarieElliot(Mattie) who passed away in 2012. An exceptional poet and friend. I sometimes go back and reread all of the emails. What a champion of words. Have a great time away and Happy Thanksgiving. I appreciate your visits to my blog home! Great that so many books are out there .. thanks for reminding us of the new ones. I'd meant to put Old Kitty in my missing persons .. I just hope her move is going through sometime ..
wonderfully fun gift ideas. As for the blogfest, I image Tina will be on everyone's list. I need to check out Ivy's blog, as I can use a laugh. lol! I love the Captain America Minion iPhone case! 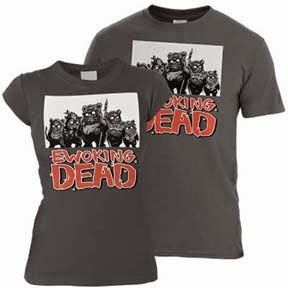 I so want one of those Ewoking Dead t-shirts! Have a happy Thanksgiving, Alex! A big thanks to laekanzeakemp for the indie review list! Awesome stuff! Well done to you with Dragon of the Stars, sitting on number 3 in the voting! I miss Kitty too. Hope it worked out for her to get her new house. Hmm. I recognize every one of those geeky references. Making me a confirmed geek I think. Love your shout out to Tina. Very nice. I like the idea behind this blogfest...because these are friends, not just bloggers, and when they're not online we can really feel their absence. What a great list of fellow bloggers! Love all of those geeky Christmas gifts. The "Red Shirts" one made LOL. And Groot is already one my kids' list... all four of them. My 5 year old girl is dying to get her hands on that movie when it releases. We watched it at a dinner movie theater and she loved it! And I've always loved Ewok's so I think I might have to sneak in a self-purchase!! Great choices of the six named. I think we all miss Tina. Alex have a safe Thanksgiving and watch out for the idiots on the road. I see R2-D2 gadgets advertised in my Facebook feed a lot. He can be a car charger for your devices or come apart to become a set of measuring cups and spoons. We'd sure miss you if you stopped blogging, Alex! Ivy, I hope you don't step away again! Dixie, it's so hard when we lose a blogging buddy like that. Hilary, I really miss Kitty. And you nailed it - Heather has really stepped up to fill the void. Lynda, they had a dozen more! Dani, seeing it at a dinner theater would be awesome. And sounds like your house will be full of Dancing Groots. The Ewoks are adorable and so is that minion phone case. But, I think I may buy that Dancing Groot, just perfect for my hubby! He'd get a kick out of it. Tina is truly missed and I'm glad you highlighted her. I'd also miss Ivy - terribly. She's such a fun blogger to read. I think I'll get the minion cases for the dwarves. I want a dancing grout myself. That's one plant I am sure will not dry in my presence. I'll also add Jeremy's shirts to my Wish List, although Santa always brings me coal. Probably because he knows coal is good for inner dragon fire, hahaha. Ah, I miss Tina too. I often think of her. The Ewoking Dead t-shirt... I want that!!! LOVE it! I'd miss LG at Writing Off the Edge, too. She's awesome! I miss Old Kitty, too. Minions! :) And that Ewoking Dead shirt cracked me up. Have a great Thanksgiving, Alex! Dainty gifts and great new releases. Should be good for Christmas. Have a great Thanksgiving Alex! So sad about Tina. She was always such a light. I love the red shirts shirt! I only just got to know Ivy at the Happy Whisk, but I agree, I would miss her. There are so many I would miss but of course Tina tops the list. I still can't accept her loss. Elsie, we'll probably end up with one of those Dancing Groots. Al, Jeremy has some awesome shirts. I saw that Groot bobblehead and thought it was cool, too. They also have the whole Trueblood cast, but what I'm really looking for is a Poe one. With a big head, not a little head (I found one with a little one). Just wanted to say hey. I posted a LONG post, a lot of rambling and whatnot...you don't really have to read it; I know you're busy. Just finally coming out of my slump and wanted to fill everybody in. I've always appreciated you and IWSG. You have always and will continue to be an important part of my writerly journey. Thanks. Love the geek Christmas gifts. Must get busy with my shopping, after Thanksgiving. I like to see the gadgets bt would never buy one. As soon as you loose interest they will turn into dust catcher. Thanks for helping promote the Holiday Food Drive. I will always miss Tina here in Blog Land. I would miss several other people too, friends I've made that are true treasures in my world. Happy Thanksgiving to you and yours, kind friend! I just might have to get the Dancing Groot. What is a groot? Happy thanksgiving to you and your family. Have a wonderful holiday. Ewoking Dead! That is awesome! You're exactly what a best friend should be. I don't know what I'd do without you. Thank you, my friend. L.G. and Ivy are great bloggers. I miss Tina, too. I hope we are all doing her proud. Have a wonderful Ninja Thanksgiving with your family. I want a dancing Groot. I do miss Tina. Still can't believe she's gone. I like geeky stuff. My Christmas list just got longer. Love seeing Tina included. Great Blogfest, Alex. Hmm, a dancing Groot. Will tweet about the food drive. Be safe in your travels and have a wonderful Thanksgiving. I'll be cooking on the farm and having lots of people here. The Ewoking Dead cracked me up. I dig the Ninja Army shirt, too! Congrats on getting to the top three of the Goodreads list. Woo hoo! Have an amazing holiday--you deserve the time off. haha I'd have to go with the dancing Groot too. They must be making some pile of money off the merchandise for that movie. Thanks for the shout and yeah many to miss indeed. Awesome geeky gifts! I voted for your book. :) There are so many bloggers I'd miss if they stopped. Like Tammy Theriault. She really makes me laugh. Have a wonderful Thanksgiving. I'm loving the Minion phone case and the Groot. I think the Dancing Groot is going to be tough to find this Christmas. From your Miss You Blogfest list, I've got some new sites to visit. I am going all geeky over Groot!!! I must have one for my desk. So love it. Best of luck with the blogfest. Mike, I will be by later to read! Thanks for the kind words. "Honey, I got you a melting Nazi for Christmas! ...Why are you upset?" I miss Tina too, and like you, I couldn't name all the people I'd miss. I'd miss everyone. So... it's just best if everyone sticks around. Great choices, and now I have a couple new blogs to follow! I wish I had gotten to know Tina sooner. One of the best gift collections I've ever seen. I could use a couple of them! Will get Pat's book right away, she's awesome. Indie book reviewers is a great resource. Have a great Thanksgiving. . . we are thankful for you. We're participating in some local food drives. I miss Mark too and I would definitely miss Ivy. I should have put her on my list. Great gift ideas, Alex. Particularly the dual purpose No Red Shirts? tee. Great for ST fans and for Cal fans at a Stanford match-up where you take your life in your hands if you show-up wearing red. Me buy geeky gifts? If you only knew how many pictures I took with the skeleton I bought at COSTCO for Halloween! Thanks for listing Dead Wrong with the new releases, Alex. I really appreciate that. Love the geeky gift suggestions. 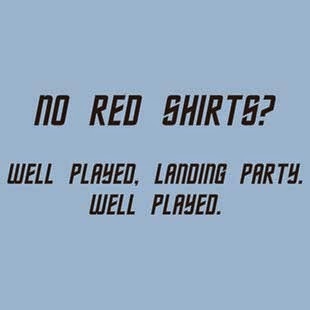 The no red shirt T-shirt would be perfect for my Star Trek loving husband. That Star Trek t-shirt is too cool. I might have to make that a Christmas present for myself. I've enjoyed checking out the various blogs mentioned for the Miss You blogfest. It's a great way to find other interesting blogs to check out. HA! That Ewoking Dead is FABULOUS!!! And I miss your missed bloggers, too. Oh i remember Old Kitty! I wonder where she got herself off to? Some popular gifts here I'm sure! Some great folks on your 'Miss You' list and it is wonderful to see Tina remembered on so many blogs today. 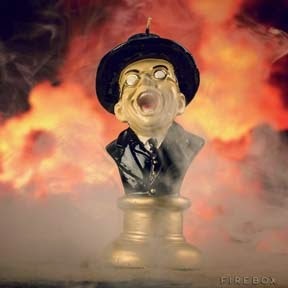 The melting Nazi candle cracks me up. I loved Joss' dog theme - have to go check out her post. I love to look at wacky gifts, but I hardly ever buy them. Maybe if the Ewoks had been zombies, they wouldn't have ruined that movie. Love the Star Treks T-Shirts and the Ewoks-too funny! I loved Joss's dog theme post and she is so much fun. Have a wonderful thanksgiving and if i didn't say it before-In the week of thanks-Thanks for being on this blogworld and convincing me to do the A to Z challenge! Hi Alex! Loved this post! Your gift suggestions actually helped me big time ~ got this eighteen year-old nephew ... I'm looking forward to checking out new blogs through this blogfest. Have a good one! I love Dancing Groot! Good gift! Al, you should post those! Angela, you are most welcome! Suze, I have that t-shirt and wear it all the time. Dianne, that made me laugh!!! Birgit, thanks, and glad you did it. Thanks everyone and have an awesome Thanksgiving! Happy Thanksgiving to all those who celebrate. And a happy day to all the rest of us. I have lost/misplaced a few bloggers and while I miss them they have enriched my life. And still enrich it - even in their absence. Who would I miss? So very many people. Education, beauty, laughter... I would be very, very ungrateful if I didn't. You had 69 comments, and I'm commenting so you don't anymore, lol! My father was a Star Trek fan, so that T-shirt about the red shirts cracked me up. He would've appreciated that one, I think! Blogging is a crazy thing. Sometimes people just get tired of it, or life gets too busy, and they quit. I'm not sure they realize quite how much they are missed. Maybe this blogfest will help them to remember and carry on! I mostly just hit ThinkGeek. They usually cover, well, everything. I've been looking for the perfect Christmas gift for my brother, and the hamburger just might be it. It's that perfect combo of obscure pop culture reference and humor. I love the Dancing Groot and Captain American phone holder! Those are cute presents for geeks! It's hard to believe Christmas is in a month! Thanks for hosting the blogfest. I'd miss the Happy Whisk lady, too! Cassie, what's wrong with sixty-nine? Good to hear from you. Liz, Jeremy would appreciate it if you ordered it! Love the Dancing Grout and Captain America iPhone case! Terrific list of bloggers, and it's so sad about Tina. Hope you and your wife have a wonderful Thanksgiving! I would forever be in my brother's good graces if I got him a Star Trek shirt. I would buy the dancing Groot for myself. Have a great week. Geek gifts are the best gifts! Fun and funny gifts that you found and posted! Also, great blogs that you do miss and would miss if they weren't out there. What a fun and exciting world we live in with cyber connections all over! That case is an epic combo of Captain America and Dispicable Me and Mark is missed by many of us. I especially love the dancing Groot! What happened to Old Kitty? I've followed her blog for a long time but she hasn't posted for a long time. I love that blog post of all the 500+ review sites. Thanks for posting that. Murees, nothing wrong with getting yourself a gift! Clarissa, I knew it would help someone. And last I heard, Old Kitty was trying to buy a house. Oh, I feel so special now! Thank you! Reading this post really made my day! And for the record, you're not allowed to quit blogging either. I'm even wearing my Ninja Army t-shirt right now. We all miss Tina. She was definitely a ray of sunshine in this blogging world of ours. Love the Star Trek t-shirts! The moment I saw the baby Groot dancing at the end of GotG I just new it was going to be a toy. How could it not? Some very cool, geeky, stuff for the holidays....especially digging that melting Nazi from Raiders! I hope you have a very blessed holiday season. LG, you're welcome, and I'm not quitting. That you're wearing your Ninja Army t-shirt is just beyond awesome. Mark, you're geekness is always appreciated here. Great t-shirts, Alex. Congrats to all those with new books out. I didn't know Tina that well, but I do miss her daily. She touched many hearts. Awwww, I want a dancing Goot. I may have to show that to hubby. WHY IS DANCING GROOT AVAILABLE AFTER CHRISTMAS????? Don't they realize what a great present that would be for hubby to give to me? Haven't published anything yet, but I've bookmarked the list of indie published reviewers. thanks for the tip, Alex. The whole red shirt thing always makes me laugh since Scotty is a red shirt. At least in Classic Star Trek. You have so many comments I don't know how you read them all. Maybe you don't. I wouldn't blame you. What, pray tell, is a groot? I just voted for your book. I miss Old Kitty. She hasn't blogged since summertime. Cool gift ideas. Love your geeky gift ideas. I blog so sporadically that I almost feel like I'm lost when I do step back in, but regardless of long I disappear you always welcome me back with comments. You are the number one blogger I would miss. You seem to keep everyone rolling and I am eternally grateful. Congrats to Pat, Patricia, and Angela! Love the Raider's candle. However, I think I could only light it when among friends. People already think I'm odd. miss in the blogging community as they are upholders of light in the blogland. ps- Nice to see Pat's new book on display..
Patricia, I know! I guess they didn't expect it to be so popular. Janie, I do read them all. And Groot is from the movie Guardians of the Galaxy. TBM, but odd in a good way. Truedessa, Happy Thanksgiving to you! I do know the people you spotlighted in your blogfest and this is the second time I've seen Tina mentioned. She was a beacon. Congrats to authors on all the new releases. Tina was one-of-a-kind...a special person. Okay, now I have to get the dancing Gru. Yay! So cute. Huge congrats to Pat, Patricia and Angela. Alex, nice gift ideas, especially the Ewok shirt. Thanks for the mention, too! Dancing Groot is hysterical! Thanks for bringing these bloggers to my attention. It is my intent to get back into visiting blogs and commenting on a consistent basis! Happy Thanksgiving! Love the Dancing Groot. I will definitely miss you, so please don't ever stop blogging :) I will also miss Lynda and Rahul if they stop blogging. That Dancing Root is adorable! I hope you have a wonderful Thanksgiving, Alex! 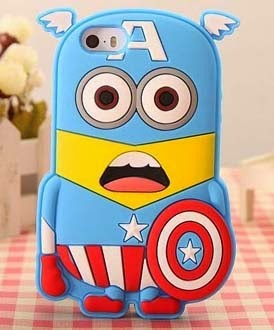 I'm lovin' the Captain America Minion iPhone case...too cool. And the Ewoking Dead shirt is just too funny! Hope you have a wonderful Thanksgiving, Alex! The phone case is cute!!! I know Mark's blog, he does write good stuff. I haven't visited for awhile (holiday deadlines on giveaways are keeping me busy ;) ). I'm headed that a'way now! Have a happy holiday!!! Those are great gifts. I especially like the No Red Shirts sign (which likely ain't for sale). I miss Old Kitty too. Hope she's doing okay. Have a wonderful Thanksgiving and holidays, Alex. Yes, miss Old Kitty and Tina. Mark will be back, right? and LG, maybe. I voted for Dragon of the Stars. Good luck! I still miss Tina, too. And I hope Old Kitty returns. I miss Old Kitty's blog posts too. Certainly, if you'd stop blogging you would miss! I miss Tina too. It was a big loss for the blog-world when she passed away. Thank you for recommending Steven's blog. It was awesome to see someone who does what I do for a living. I don't see that very often! I love that first gift at the top, but I don't know of too many people who would like the other gifts. My ex-husband and his friends--that would have been PERFECT for them, though! I am gifting myself the Dancing Groot. I would miss many bloggers and you would be one. i miss tina as well...smiles. There are quite a few bloggers that I miss simply because they either stopped or post so infrequently that I often miss their posts until weeks later. Lisa from A Journal of Random Tangents. I still see her from time to time on Facebook but her blogging has become very infrequent as the real world has taken precedence. Siddity. She has a blog called plainly enough, "Siddity" which is about her trials and tribulations about being in an interracial relationship. She also posts very infrequently. Elsie from Integrated Memoirs. Hers was one of the 1st interracial blogs that I started following back in 2008. In the summer of this year, she simply upped and vanished with no notice and she deleted her blog as well. What great toys, and that review site list is awesome. I have been waiting for that Baby Groot forever! Guardians of the Galaxy was so full of fun and joyful tears in the end, I can't wait to watch it again. Have a wonderful Thanksgiving, Alex. Rachna, thank you! I won't stop. GB, sad she deleted her blog. Anna, it comes out next Tuesday! Thanks again Alex, and thanks to those who came and visited and the two who joined. Neato stuff. PS: Regarding your comment, yes you were right about the title. I went back and changed it to Tim's name. Thanks and boogie boogie. Those gifts are fantastic!! I kept giggling as I scrolled through them. Thanks, Alex! Retro Ts are such fun. I love, love, love Better Off Dead! Awesome unique gift choices. Happy Thanksgiving, buddy!! Love the geeky gifts . . . my daughter and I did a similar post on Sunday for my publisher :-) I think I'll need to get that Dancing Groot for hubs! I gotta get some of those dancing Groots. Thanks for the tip. Happy Thanksgiving. Heh! I'm the only geek in my family, or so it seems, so I have little reason to look for geeky gifts. Except for myself, and that's not really what the holiday season is for. ^_^ That Star Trek shirt is pretty clever, though. And that article by Mr. Symes was interesting. I've heard similar sentiments from other full-time writers, but most aren't as frank about it. A good read. Happy Thanksgiving, Alex! Enjoy your holiday travels. And as far as which bloggers I would miss if they stopped blogging? All of them. I'm finally here. All those crazy gifts were probably snatched up over here. I note the madness and the nasty behaviour of some shoppers is being emulated over here. Yep, Black Friday, UK. Help us! Gosh, the A to Z and dogs. Ignore it, Penny. You make three thoughtful choices in regards to those you miss. And those you would miss, now I know the Whisk's actual name. Hope you had a nice Thanksgiving, US style. Funny gifts. Wow, you have a lot of comments. I hope Thanksgiving was awesome. OMG! Now I want a dancing Groot! Thanks for sharing the link to the list of reviewers. Sounds like a very happy list of people who would be missed if they went away. Thanks for doing this hop! Just swinging over to tell you we saw Big Hero 6 last night. That was good stuff! Hope you had a great holiday! Those are hilarious geek gifts! I miss Mark's more frequent posts and I miss Tina too. Didn't realise Mark had slowed down. He's a good egg. Hi Alex! I hope you had a nice thanksgiving! I would really love a dancing groot. I always look forward to your "Oh How I miss you blogfest." The Star Trek T-shirt is a must -- good stuff. 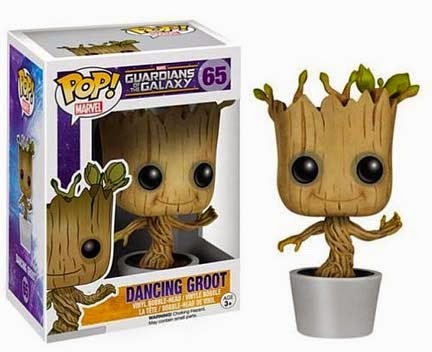 :O Oh my gosh the dancing groot is so CUTE!!! Love the geeky Christmas gift ideas! I hope you get spoiled with some of them and that whoever you're shopping for appreciates what they get. I so want that dancing Groot! Happy blogging! I miss all these bloggers. Old Kitty was great, as was Charlie and her new cat. She was fun to visit and catch up on all those feline hijinx. New books? I finally downloaded the first Game of Thrones and am 200 pages into the 800 page book. I know, I know, I'm so late getting to the party. But hey, those potato chip crumbs at the bottom of the bowl and picked over finger sandwiches aren't that bad. You'd be surprised at the tasty sandwiches you can put together with the scraps of meat and cheeses and breads strewn across the table. Hope no one sneezed on them though. I'm amused by the melting nazi candle and the ewoking dead. My husband pre-ordered Groot, so we'll have that any time. I collect the Pop villains/slashers, one for each publication I'm in. I ordered one today for the IWSG Guide to Publishing! Excited about the IWSG Book! A big, huge thank you to YOU and everyone who worked to make it a reality! Hope you had a happy Thanksgiving. I want the Dancing Groot. So cool. I miss Tina too. Sorry I missed the blogfest. 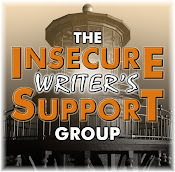 BTW, did you know the IWSG book isn't free on Amazon?